(Nanowerk News) A team of scientists, led by Boy Lankhaar at Chalmers University of Technology, has solved an important puzzle in astrochemistry: how to measure magnetic fields in space using methanol, the simplest form of alcohol. 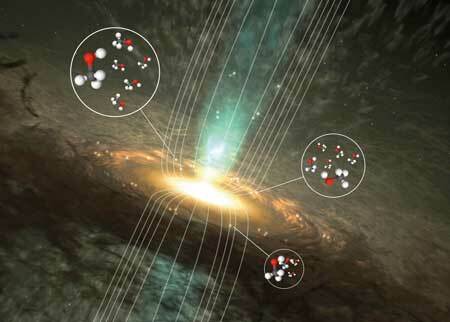 Their results, published in the journal Nature Astronomy ("Characterization of methanol as a magnetic field tracer in star-forming regions"), give astronomers a new way of investigating how massive stars are born. Scientists can measure temperature, pressure and gas motions when they study the signature of molecules in the signals they detect. But especially where the most massive stars are born, there's another major player that's more difficult to measure: magnetic fields. "When the biggest and heaviest stars are born, we know that magnetic fields play an important role. But just how magnetic fields affect the process is a subject of debate among researchers. So we need ways of measuring magnetic fields, and that's a real challenge. Now, thanks to our new calculations, we finally know how to do it with methanol", he says. "The maser signals also come from the regions where magnetic fields have the most to tell us about how stars form. With our new understanding of how methanol is affected by magnetic fields, we can finally start to interpret what we see", says team member Wouter Vlemmings, Chalmers. "We developed a model of how methanol behaves in magnetic fields, starting from the principles of quantum mechanics. Soon, we found good agreement between the theoretical calculations and the experimental data that was available. That gave us the confidence to extrapolate to conditions we expect in space", explains Boy Lankhaar. "Since methanol is a relatively simple molecule, we thought at first that the project would be easy. Instead, it turned out to be very complicated because we had to compute the properties of methanol in great detail", says Ad van der Avoird. The new results open up new possibilities for understanding magnetic fields in the universe. They also show how problems can be solved in astrochemistry - where the disciplines of astronomy and chemistry meet. Huib Jan van Langevelde, team member and astronomer at the Joint Institute for VLBI Eric and Leiden University, explains. "It's amazing that such detailed calculations are required to reveal the molecular complexity which we need to interpret the very accurate measurements we make with today's best radio telescopes. It takes experts from both the chemistry and astrophysics disciplines to enable new discoveries in the future about molecules, magnetic fields and star formation", he says.